The event looks to be pretty much on track, so please see the post below from this afternoon for details left out here. The models have come into decent agreement with the "outliers" a little more in line. 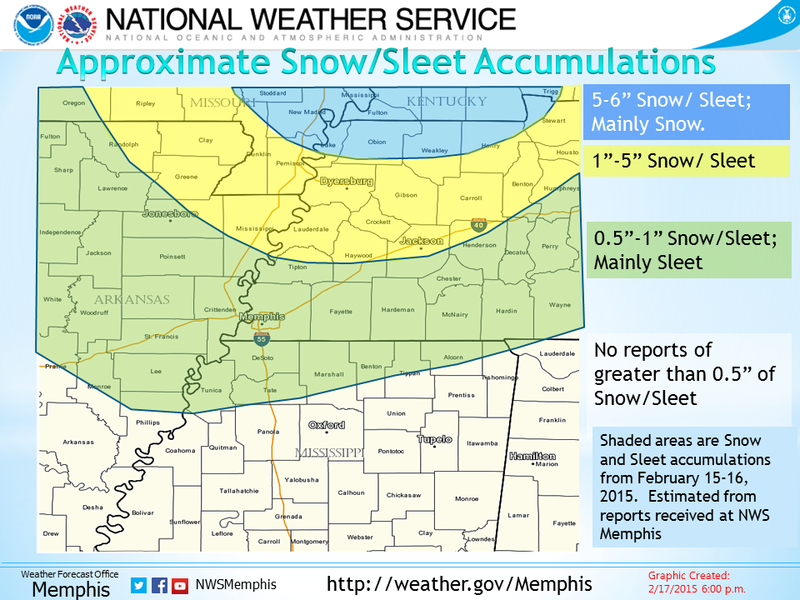 Confidence is increasing in the forecast made below, which includes about an inch of snow for Memphis and Shelby County, more south, less north. That means that we should be all snow by 2pm or so with temps at 32-33°. The best time for snow that could accumulate will be 2-6pm for just about everybody. Flurries could last into the evening. 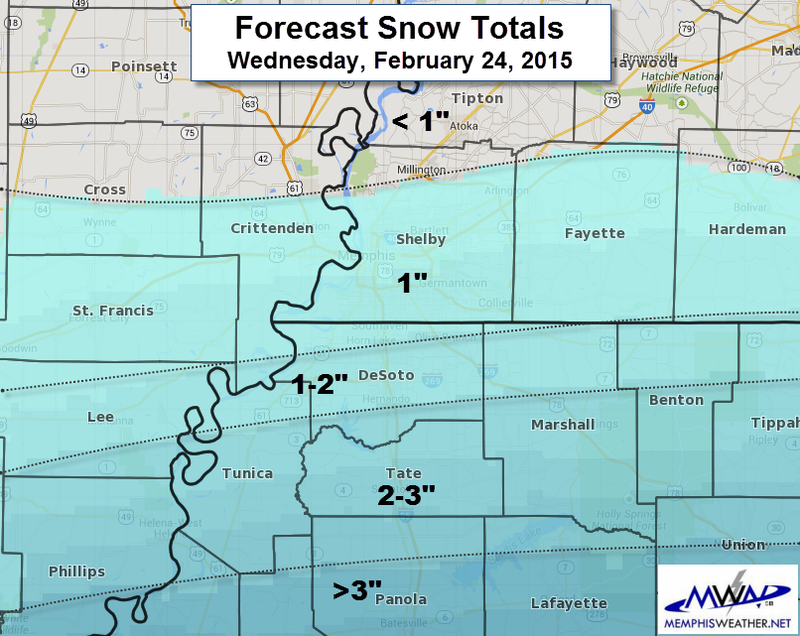 Forecast accumulation remains as indicated in the map below (1" in the I-40 corridor). Roads should be fine through mid-afternoon, but after 2pm, elevated roadways and exposed surfaces could start seeing accumulation and/or become slick, especially in north MS where snow could come down a little heavier. The winners from tomorrow's snow will be south of the metro, somewhere in an area from Clarksdale to Oxford to Tupelo where 4-6" is expected. We'll keep you updated tomorrow. I have meetings at work all day, but Mississippi State has cancelled classes, so the social media posts will continue unabated! Thanks #TeamMWN! 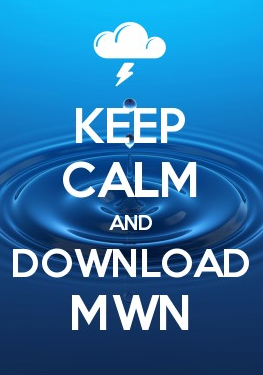 Get our latest forecast on the MWN mobile apps or mobile web. 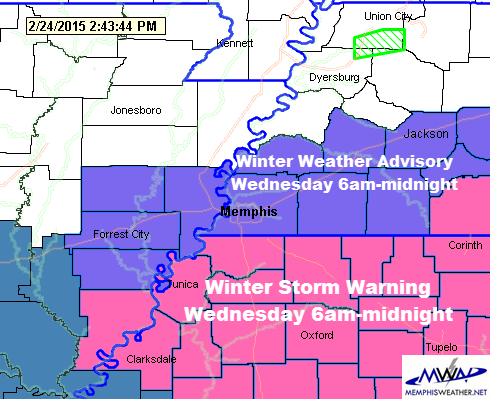 A Winter Storm Warning has been hoisted for all of north MS and a Winter Weather Advisory for southern west TN and east-central AR as yet another (I think this makes 5th in under two weeks? I've lost count...) winter storm moves through the Mid-South on Wednesday. This system once again moves along the southern stream - with the arctic jet stream to our south. In fact, of all the weather systems the past few weeks, this one seems to have the most "classic" setup for southern snow. In this case, it appears the I-40 corridor will be on the northern edge of this one! Low pressure will move along the Gulf coast with Arctic air in place on its north side. As moisture rides up and around the low into the southern U.S., it will fall into cold air which has seeped as far south as the I-20 corridor in MS and AL. North of that area, snow will fall. The greatest combination of moisture and dynamics, with sufficient cold air, will reside across southern AR into northern MS and AL, where the heaviest snow is expected. Wednesday's surface map shows low pressure in the Gulf and snow (and some freezing rain) across a wide area of the interior southeast and Mid-Atlantic. 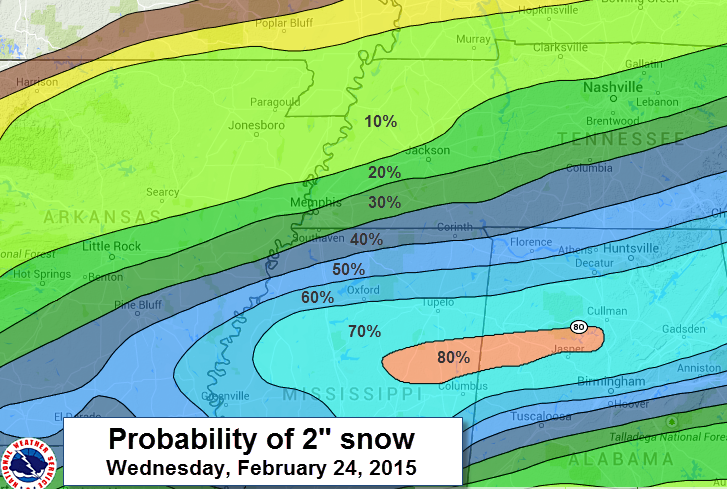 This map from NOAA shows the probabilities of an area receiving 2" of snow Wednesday. Note the best chance of significant snow will be across north MS and AL with decreasing chances north. Temperatures will rise into the mid 30s by noon Wednesday as precip approaches from the southwest. Precipitation will likely start as a rain/snow mix but quickly transition to all snow as temperatures fall back towards the low 30s after precip starts. The snow should taper off by early evening, ending as flurries during the evening hours. 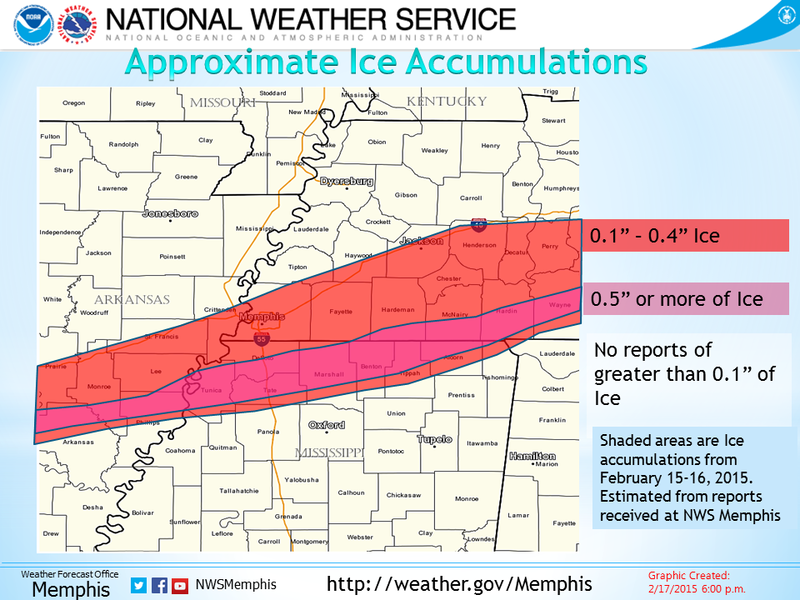 We are not expecting any ice accumulation with this event. Snowfall totals by Wednesday evening should look something like we have shown below. When: Starting after 9am in Tunica/Tate Co and after 12pm in the I-40 corridor. Ending by 6-8pm. Impacts: Roads coated with snow in north MS and possibly parts of the metro. 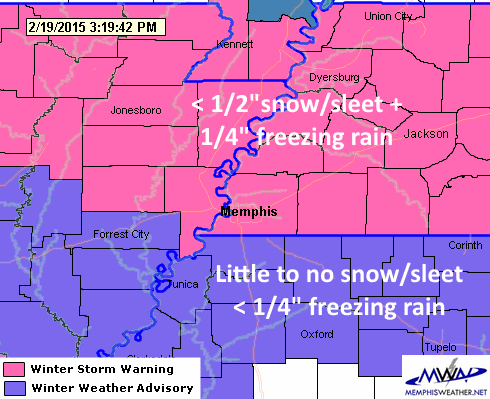 Slick areas expected on elevated roadways in the I-40 corridor (including Memphis/Shelby County). Bust potential: Moderate. 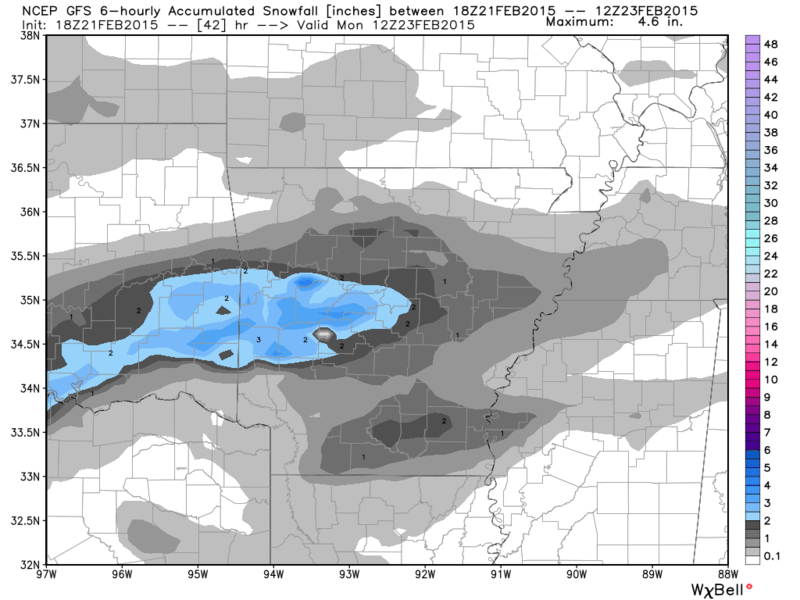 One typically believable model (and its offshoots) have up to 4"+ along I-40. Almost everything else says about 1", or even a bit less, in the same area. For now, it's an outlier, but it makes the 1" forecast a little more plausible. On the other hand, the northern edge of the snow may not make it north to I-40, in which case we'll just root for spring! After this system, another couple of cold days are expected, as you can see in our MWN Forecast, but then it appears we have a warm-up for the weekend and a RAIN event to start March! That's a good thing because it's much easier on me (and you!) and the roads and vehicles could use a good washing down. 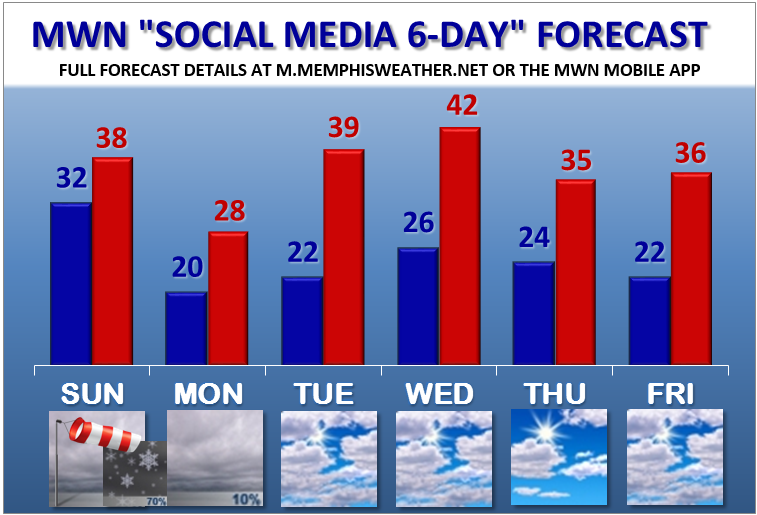 Plus north MS will be ready for the snow to disappear! We'll keep you updated as the even unfolds. The last week of February brings... more snow and cold!?! Wow, what a week! It's like winter showed up as soon as the rodent popped his head up out of his hole on February 2! Somebody whack that guy! It's been a cold winter, but we've been dry. That changed this week with multiple icy systems that nearly provided most students in the area with another week-long "winter break" just a few weeks before spring break! Many people were surprised by the cold temperatures during the day today after highs were predicted in the mid 50s. Technically the forecast wasn't wrong - it was 58 around 8am today. It just started dropping a few hours faster than we thought! Most of the day was spent in the upper 30s to lower 40s with periods of heavy rain. In fact, over 2" fell at MWN since midnight last night, plus the nearly 1/2" we got yesterday. A strong north wind and abundant cloud cover will make Sunday feel very cold. Temperatures only bottom out near freezing tonight but they don't climb much tomorrow. Highs will be in the upper 30s with north wind gusting at 25-30 mph, keeping wind chills well down into the 20s. You'll definitely notice it as you head out tomorrow. 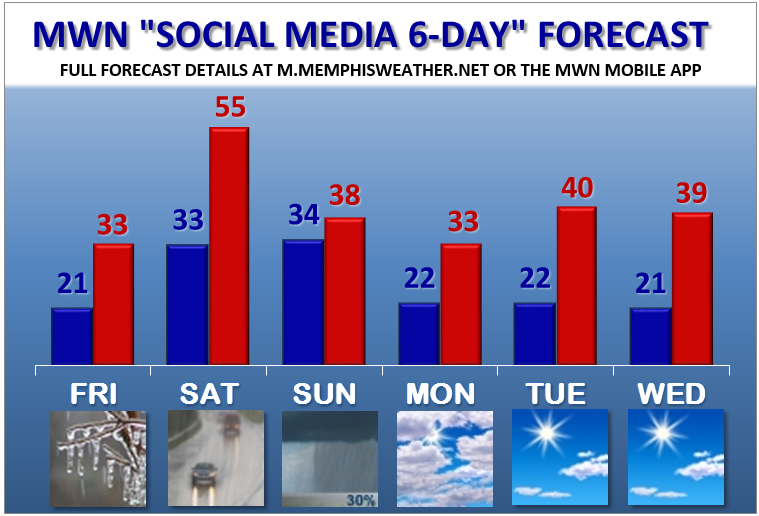 Sunday night is the next chance of winter weather as a disturbance in the force moves across the Mid-South. With all the focus on the Friday event, this one snuck up on most of us. However it's looking fairly likely that light snow will fall Sunday late evening (after 8pm) into the overnight hours, ending by dawn Monday. How much? 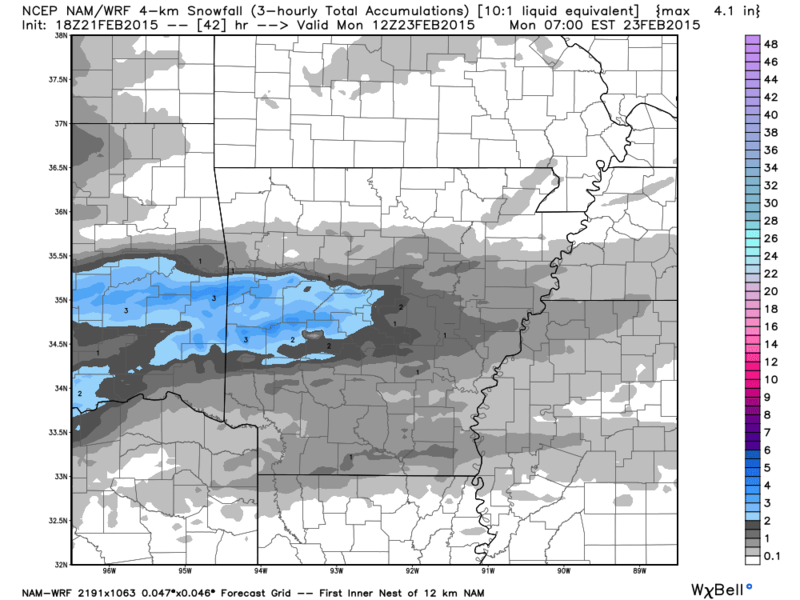 The NAM4 and GFS (shown below) are very similar indicating that the heaviest will be across west-central AR, but that we could see around 1/2". Sunday night forecast snowfall amounts per the mid-day GFS computer model. Graphic courtesy WxBell. For the rest of the week, the southern stream remains active as the arctic jet stream remains to our south. That will mean cold air continues to blanket the region to close out the month. With the jet to our south, any disturbances that come through could mean additional chances of light snow. Right now, we haven't pinpointed any particular time that could happen past Sunday night, but there are a few coming - we just don't have a handle on exact timing yet. Let's hope that March bring better weather than February did! The good thing is sun angles are getting higher, daylight is getting longer, and we'll eventually head towards a more spring-like pattern. It can't come soon enough! Thunderstorms are better than thunder freezing rain! Here's our evening update on the winter weather expected on Friday via video blog (14 min). Watch for full details or see below for the bottom line. 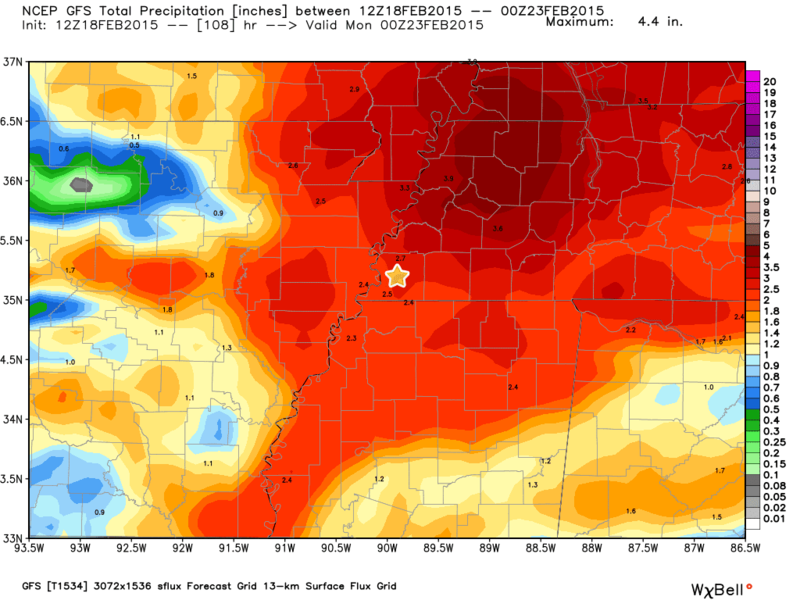 Total precipitation in west TN could exceed 2" for the weekend. 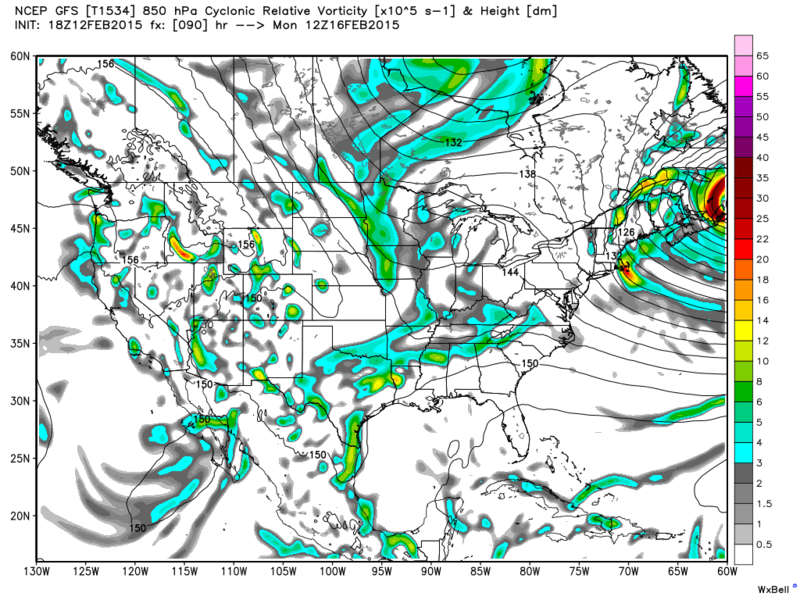 NAM model shown above. Graphic courtesy WxBell. Scattered light sleet/snow showers Friday morning become primarily freezing rain by lunchtime, increasing in intensity in the afternoon as temps near 30. Freezing rain becomes rain as temps rise above 32 by late afternoon (north MS) to early evening (southwest TN). Forecast winter precipitation amounts shown below. Heavy rain will be a threat, including a slight chance of flash flooding, on Saturday and thunder is also possible. Precipitation ends Sunday morning as temperatures fall. 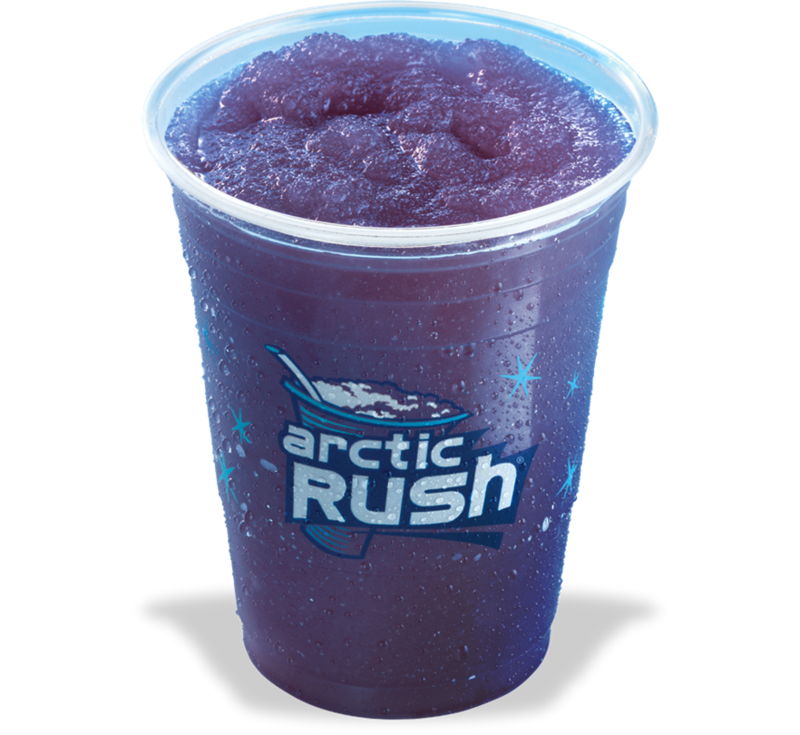 Winter storm #1 in the books, #2 on the way, but first an Arctic rush! * Per NWS official definition for climate record keeping purposes, "snow" is defined such that it includes snow, sleet and hail. 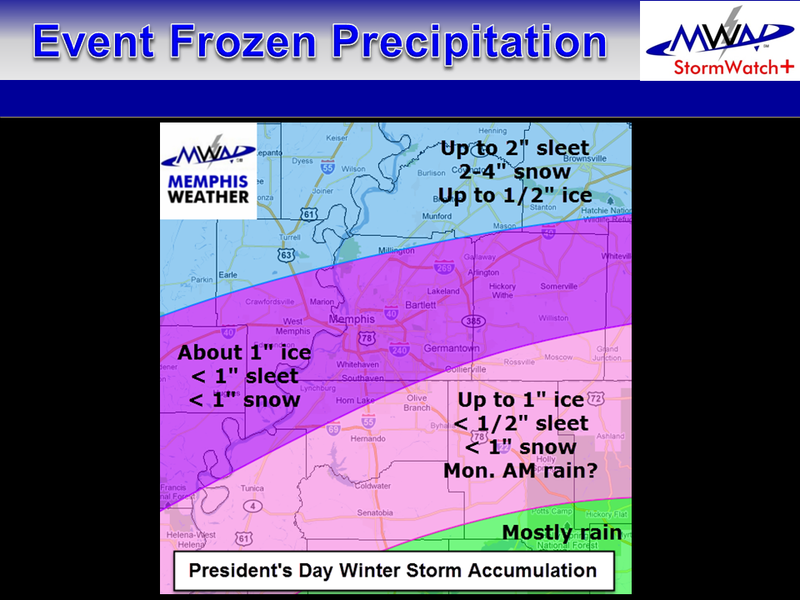 Officially, Memphis International Airport received 1.3" of sleet and 0.3" of ice (freezing rain), but no snow. However, the snowless streak has to be terminated due to the sleet. We didn't like that, so we started our unofficial counter as well! We're fortunate there wasn't a lot more freezing rain across the heart of the metro. More sleet than freezing rain meant a much lower strain on the overhead power lines and trees, though north MS got their share. Then last night we had a brief snow-blitz with 1/4" to more than 1/2" falling in about 30 minutes. It came quickly and was even escorted by a few lightning strikes! That's a #StupidCold Arctic rush! Tonight is a night that you should throw another log on the fire, drip your faucets, and of course be sure to keep pets warm and have "un-frozen" water for them and check on the elderly. A very cold day is in store on Thursday as well with highs in the mid 20s and wind chills maxing out in the teens. Clouds move in ahead of our next system with lows falling to near 20 by Friday morning. Speaking of the "next system" - another shot at winter weather arrives Friday. And by Friday, I mean much of the day Friday. We're still fine tuning the forecast and watching models get a better handle on this, but once again the best bet is not snow, but ice. Cold air will already be in place (like the last system) but this time, the low pressure responsible for the weather will not track to our south (the favored track for winter storms) but to our north. This means, that, though precipitation starts in a wintry state, temperatures will rise as a warm front lifts north of us Friday night, bringing an end to the ice. In fact, the system itself will bring quite a bit of atmospheric dynamics with it as it moves through this weekend, so heavy rain and some thunder will be possible. The weekend could be downright soggy with a couple inches of rain expected from Friday night through Saturday night. The main bouts of heavy rain look to come Friday night as the warm front lifts through and Saturday night as the cold front approaches, however Saturday will also have a high chance of rain. Being in the warm sector of the system on Saturday will mean temperatures that climb well into the 50s! 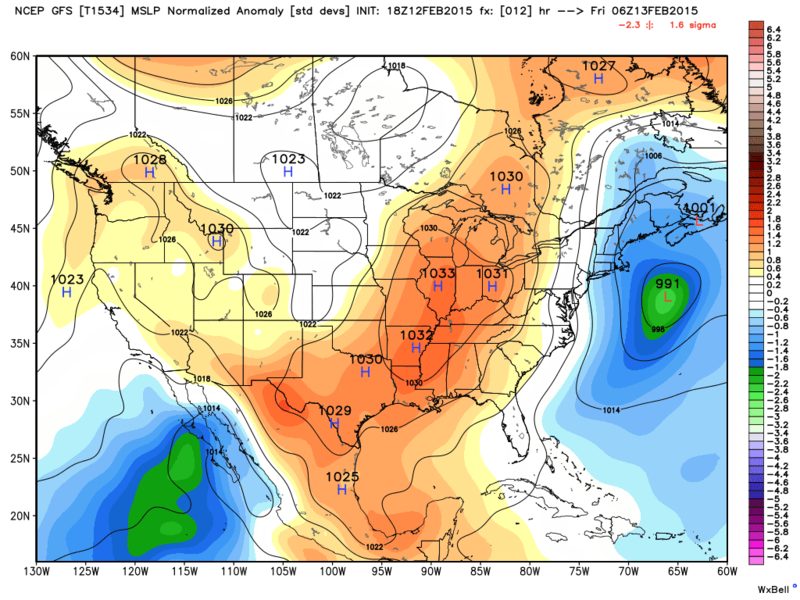 Cold air moves back in Sunday behind the front however, ushering in yet another very cold airmass to start next week. 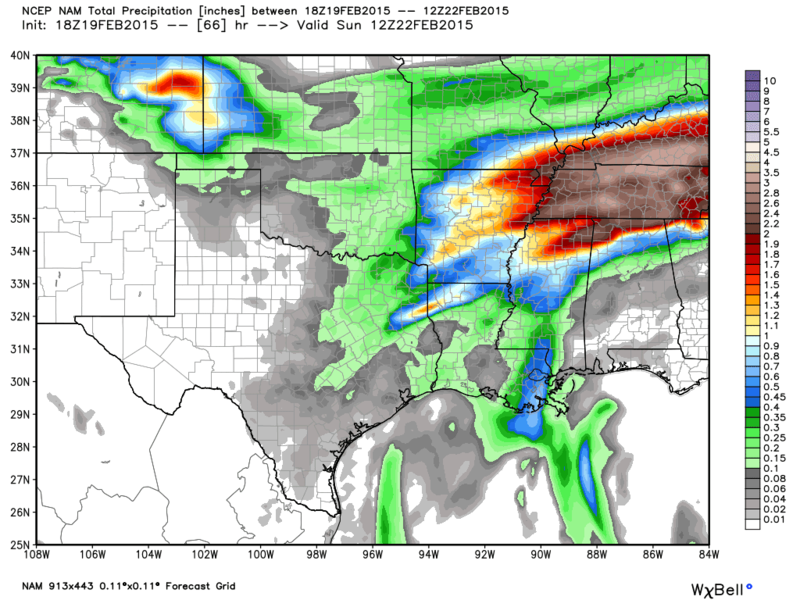 The morning GFS model is predicting 2.5-3" of total precipitation through Sunday evening. Some flooding issues could arise by Saturday night. Shelby County is the gold star. Graphic courtesy WxBell. Back to Friday - it looks like light precipitation starts early (around sunrise we're guessing right now) as a snow/sleet mix, then transitions to freezing rain, possibly mixed with sleet, during the morning, finally changing to rain by late afternoon or early evening as the surface temperature finally reaches 32°. In other words, we'll be devouring the whole cake! As for how much and the what the impacts will be, total sleet/freezing rain amounts look to stay at or below 1/4", but that is enough to mess up the already fragile transportation infrastructure that has been very cold all week. Expect icing of bridges and overpasses at the least and some droopy trees and power lines on Friday, though power outages should again be minimal if the forecast pans out. The factor working against power lines on Friday that wasn't a problem Monday is wind, which will be southeasterly at 10-15 mph. Schools COULD be out again, though we'll leave that up to the superintendents and staff - we have a hard enough time with the forecast! A Winter Storm Watch has been issued for the entire metro from 6am through midnight Friday. As temperatures rise above freezing (and keep climbing) Friday night, hopefully any ice will melt/be washed away by Saturday morning. Speaking of which, check out our SWAW webpage for safety tips and a contest giveaway schedule that features a free local storm chase prize tomorrow night from Mid-South Storm Chasers and a free storm shelter from Take Cover Storm Shelters on Friday! All credit for this goes to Rick Smith of the NWS in Norman, OK and a personal friend. It applies not only to Oklahoma, but here as well. 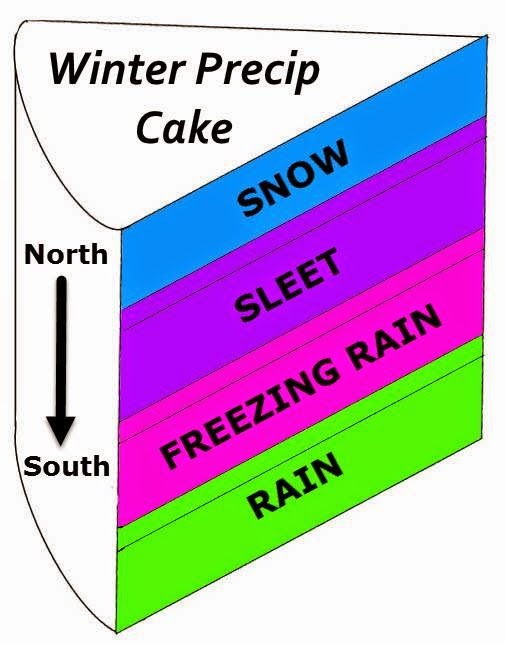 You can substitute "snow" for sleet or freezing rain throughout, depending on the particular scenario. We've said it before - winter weather forecasts in the south are HARD. Here are some contributing factors, some of which you can control. 1. Not everyone in a winter storm warning will get a lot of snow and ice. Some will get nothing at all. 2. 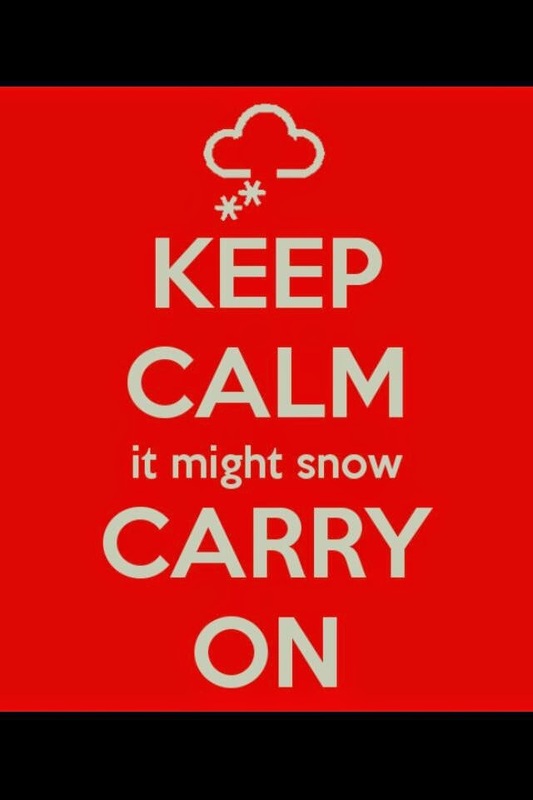 It’s very unlikely that any snow amount forecast – especially days in advance – will be exactly right. Consider it to be a range of possibilities. Also, those lines on maps dividing snow from sleet from rain look very precise, but they actually have very fuzzy edges. 3. In many cases, we’re better at forecasting the general location of where the heaviest snow will happen rather than the exact forecast amounts. Don’t focus so much on the exact numbers. 4. We try to provide you with our best forecast of snow/sleet/ice amounts as far in advance as we can. The first forecast numbers won’t usually be as good as the ones closer to the event. That’s just the way it is. 6. 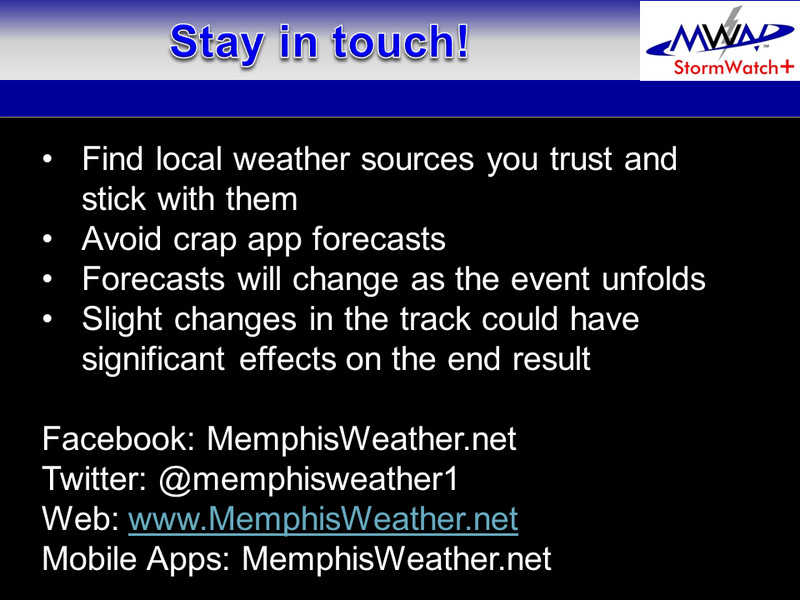 If you want the most accurate and up-to-date information, you will have to check the forecast several times a day. Otherwise, you’re working with old information. 7. People tend to focus on and remember the highest number, even if it’s from a forecast they heard days ago. This is especially true if they want it to happen. If you want it to snow, you’ll probably focus on the 6 inch amount if the forecast says “3 to 6 inches”. 8. Forecasts from the media, NWS, armchair social media forecasters, and the guy who cuts your hair who knows someone who took a meteorology course in college often get lumped together, and attributed to the generic “they”. If the haircut guy says he heard it could snow 8 inches, and everyone else says 2 to 4, many people will remember only that “they say we’re going to get 8 inches of snow.” And if there’s not 8 inches of snow, all the forecasters get the blame. 9. The volume of social media posts about snow is not necessarily directly proportional to the amount of snow we’re actually going to get. It seems like the more people are talking about it, the worse it’s going to be, but that’s not always the case. 10. Having too much snow forecast information can be confusing. Anyone can post an image of the computer model’s snow forecast. That doesn't make it accurate or reliable. Social media has made it too to easy to share this kind of information. Choose your information sources wisely and don’t blindly share forecasts with big numbers. 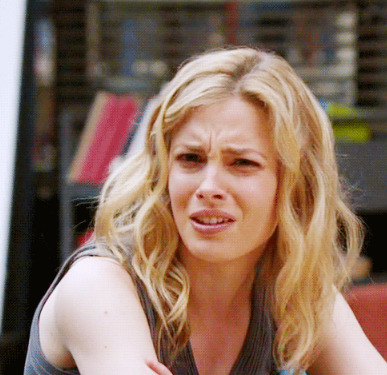 It's Valentine's Day morning, the sun is shining, it's in the 50s, and I'm typing a blog on the upcoming winter storm. To my wife: I love you and thank you for your patience and understanding! (She's awesome y'all...) Now on to what you came here for! 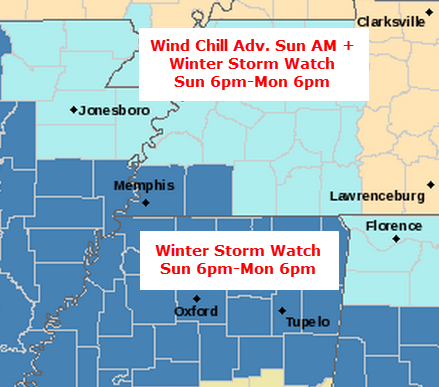 The NWS has issued a Winter Storm Watch for the entire area from 6pm Sunday to 6pm Monday. In addition, a Wind Chill Advisory is in effect Sunday morning for Tipton County in the metro and points north as wind chills drop below zero. 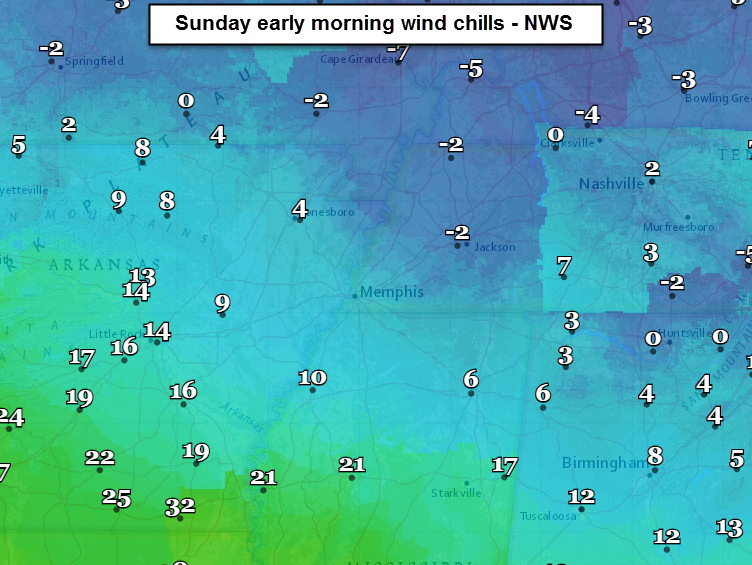 The rest of the metro can expect single digit wind chills if you're out early Sunday. NWS Watch/Warning/Advisory map valid 10:30am Saturday. Get outside today and enjoy a perfectly glorious late winter day. Temps are well into the 50s with mostly sunny skies through mid-afternoon. An Arctic cold front, that sets the stage for the next 3 days, arrives late this afternoon. Clouds move in with it, as does a stiff north wind. Temperatures will fall quickly this evening, so if you have reservations, take a coat. It could drop 15 degrees while you're eating. Tonight, temps free-fall and wind continues gusting. You might have guessed by the nearby Wind Chill Advisory. We'll hit 20 for a low Sunday morning with wind chills in the single digits for most. 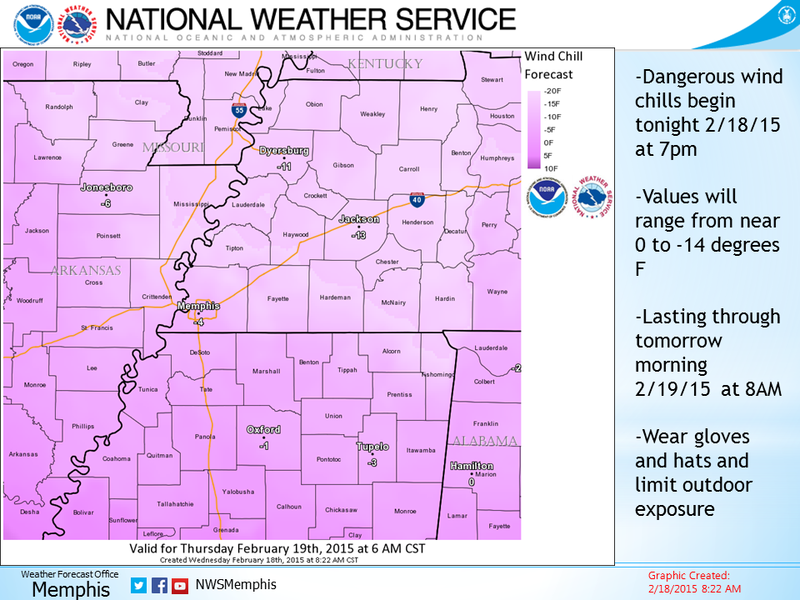 Tipton County could see sub-zero chills. Gross. The good news is it will be dry. Sunday just looks raw. Some sun is possible but expect more clouds. Wind continues from the northeast at 10-15 mph with temps struggling to the freezing mark and dewpoints in the single digits - both are important numbers for Sunday night. Wind chills don't get above 20-25. If a spit of sleet comes down Sunday afternoon, I wouldn't be shocked. This is where it gets messy. Low pressure tracks by to our south - a favorable track for winter weather. I know the use of the "I-40 corridor" term propagates myths, but in this case, it's once again accurate. I use it because it's a landmark that most people know the location of. (By the way, "corridor" doesn't mean "one block north or south," it means "the counties surrounding...") The I-40 corridor appears like it could be a significant transition zone. 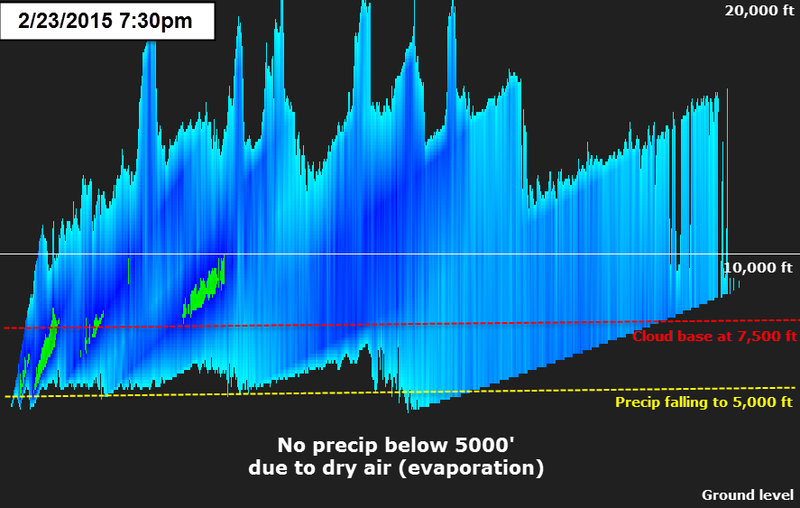 During precipitation in the metro, it appears we'll be dealing with sub-freezing air at the surface, a warm layer (above freezing - 33-40°) a few thousand feet up, cold air above that, and significant dry air at precipitation onset in the lowest few thousand feet (recall the importance of dewpoint mentioned above). If the latest trends in the models are correct, the elevated warm layer will be most prominent along and south of the I-40 corridor. This would lend itself to a better chance of snow to the north (Tipton), freezing rain to the south (north MS), and a snow/sleet mix for Crittenden, Shelby, and Fayette Co. THIS COULD CHANGE. 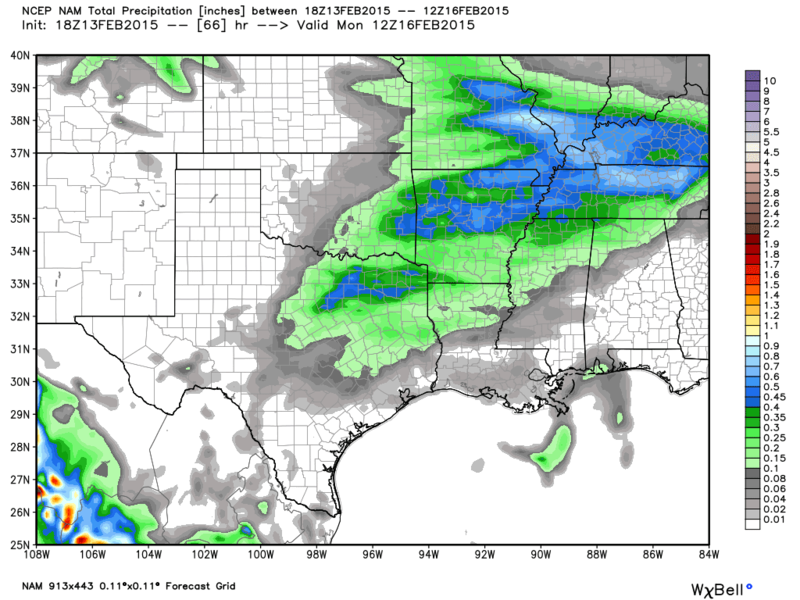 GFS model precipitation valid at 6am Monday, which are forecast is most closely aligned with. Precipitation amounts are for midnight-6am and precip type is valid at 6am. The gold star is over Shelby County. Graphic courtesy WxBell. 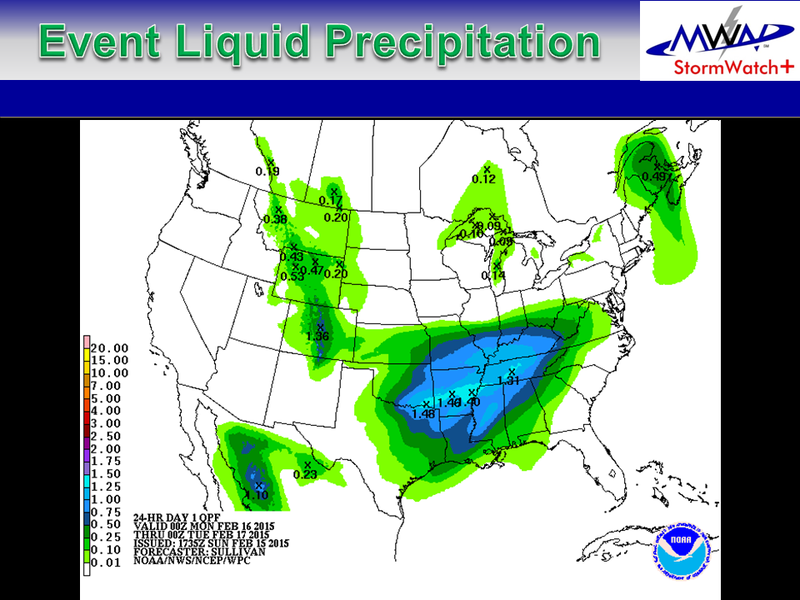 Total liquid/melted precipitation through noon Monday from the morning GFS model. The heaviest precip will fall south of I-40, but with the colder air north, the highest snow totals would be north of I-40. Graphic courtesy WxBell. Taken together, I am much more concerned about accumulating ice than snow for the majority of the event. This is a change from yesterday. The other significant change is that it now appears that instead of the precip pushing well to our south Monday, it could hang around longer. I am most concerned about north MS in this regard. The Winter Storm Watch was a good move by the NWS. I think we start off Sunday evening, after about 9pm, with a light icy mix - freezing rain and/or sleet. That should start the bridges to getting slippery. After midnight and through mid-morning Monday will be the period of heaviest precipitation. Snow/sleet to the north (roughly north of I-40), perhaps mostly sleet with periods of snow through the heart of the metro, and freezing rain/sleet across north MS. It's fortunate that Monday is a federal holiday and most schools are out. The commute Monday morning could be treacherous. After mid-morning, the threat shifts to north MS where continuing freezing rain/sleet could last into the afternoon. Significant icing is possible in these areas. Temperatures likely won't get above freezing. 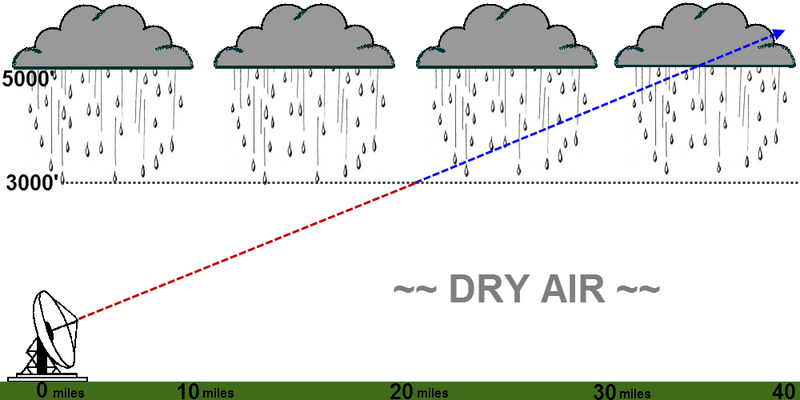 As for precipitation totals, they are highly dependent on all of the above factors. 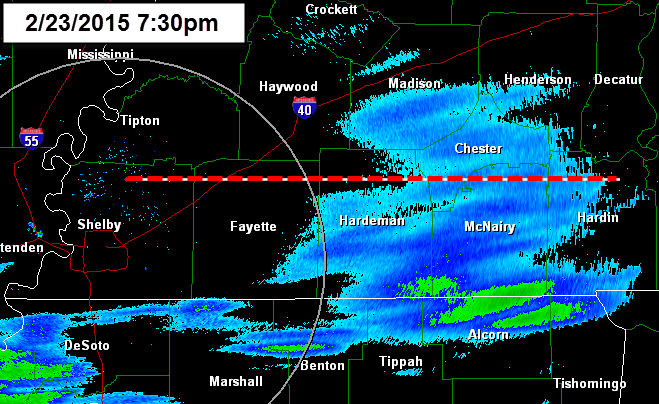 I'd say 2-4" of snow/sleet is realistic for Tipton and northern Crittenden Counties. Along the I-40 corridor (including West Memphis, Shelby and Fayette County), the most likely scenario is minor icing (up to 0.10") by midnight, 1-3" of sleet/snow overnight into early Monday with sleet more predominant than snow. For north MS (DeSoto, Marshall, Tunica, Tate Co.'s), sleet (mostly) and freezing rain are most likely scenario, with totals of 1-2" mixed with a dusting of snow. THIS COULD CHANGE. 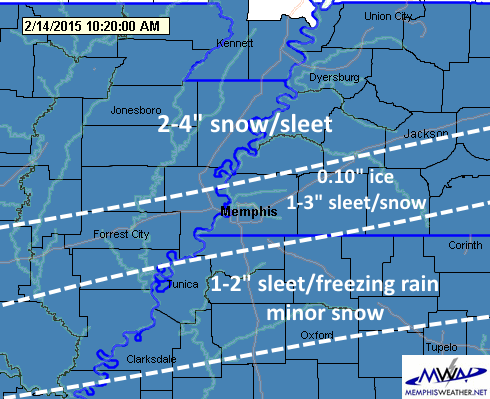 MWN's forecast winter weather totals through Monday, as of 10:30am Saturday. 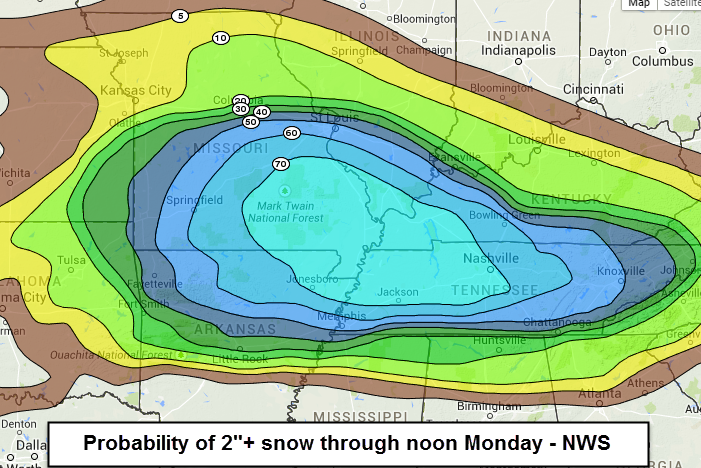 Snow probabilities are highest north of I-40, but 2"+ is possible across northern portions of the area. Models diverge even more Monday night, but if the latest trends continue, we could be looking at a wave along the front to our south pushing precip back north over the I-40 corridor. Again, ice or snow would occur in this scenario and additional accumulations would result. THIS IS HIGHLY UNCERTAIN and not in our forecast for now. 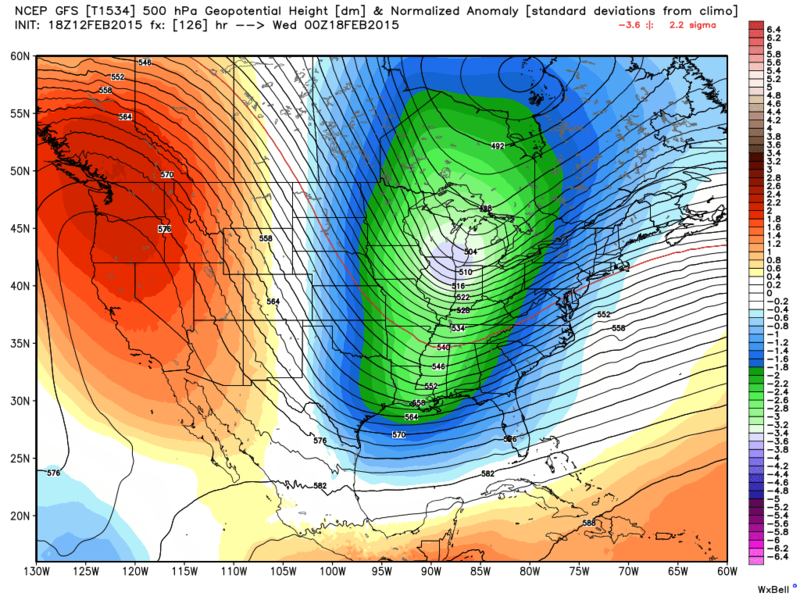 The upper-level trough and reinforcing shot of cold air that pushes this all out arrives Tuesday. For now, we only have a slight chance of snow with its passage. Beyond Tuesday, it gets very cold. Expect teens for lows Wednesday and Thursday and 30s for highs. So far, we have not had good agreement from run to run with the models. New data is coming in as I type. 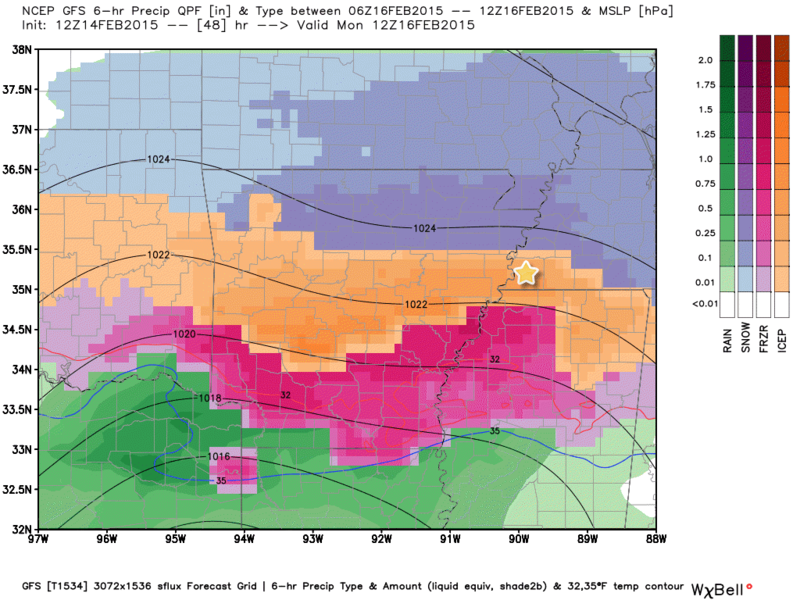 If the low tracks further north across north Mississippi, more icing is possible in the metro. If it tracks further south, more snow would result. Even if things don't change, amounts could vary significantly from one place to another in small areas. Winter weather forecasts are always tricky and highly variable. I'll remind you again - beware the share! If it doesn't pass the eye test, or isn't from a trusted source, don't share it. Snow accumulation maps from models are the worst - most people don't know that they take into account ice - multiply the ice amount by 10 and show it as snow (5" snow is actually 0.5" ice). That's why I don't post those maps in ice scenarios - they're misleading. Stay warm and plan ahead in a reasonable manner. First things first, enjoy tomorrow! It should turn out to be a very pleasant late winter day with highs in the 50s - and the last time we see temps anywhere close to that for nearly a week. By late Saturday afternoon, the next in a series of Arctic cold fronts arrives. Wind turns northwesterly and becomes strong during the evening and overnight hours. The front will drop temps overnight to near 20. Temperatures Sunday will struggle to reach freezing. 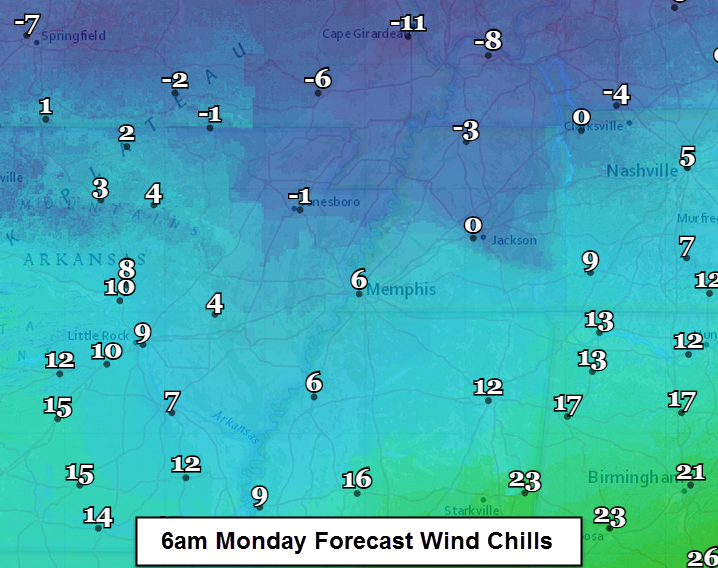 It'll be a raw day with wind chills in the teens. First ingredient for our potential winter weather - cold air. Check. 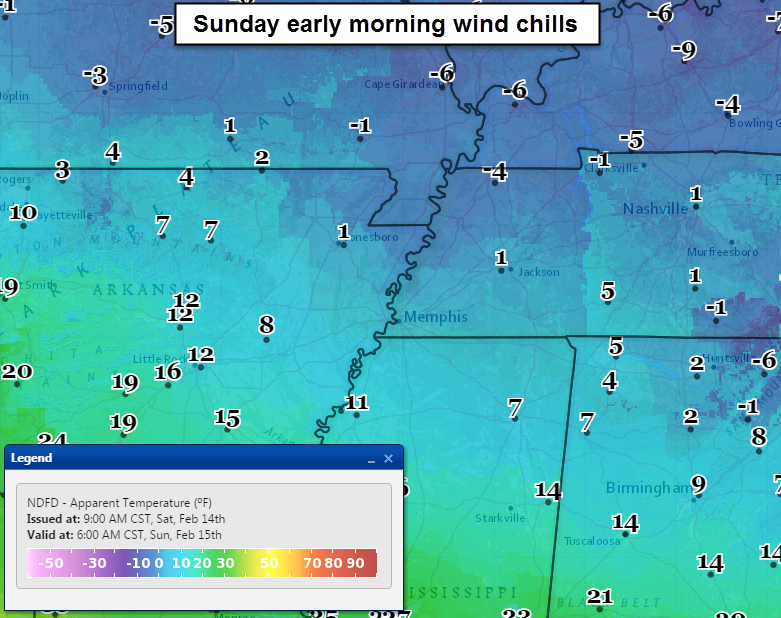 Sunday morning will feel downright raw with wind chill values in the single digits. Starting Sunday night is when things get interesting. Yesterday we discussed the possibility of a dual threat Monday and Tuesday. Since then, models have come into fair agreement that the first wave will be of much more concern, and that one looks to impact the area Sunday night into early Monday. There is still some discrepancy on the exact timing, but much of it will be overnight Sunday night and it could linger into the mid-morning hours Monday. The second wave, Tuesday, now looks to be much less of a problem as high pressure will briefly build in behind the first wave, forcing all precip well south of us for the second half of Monday and Tuesday. 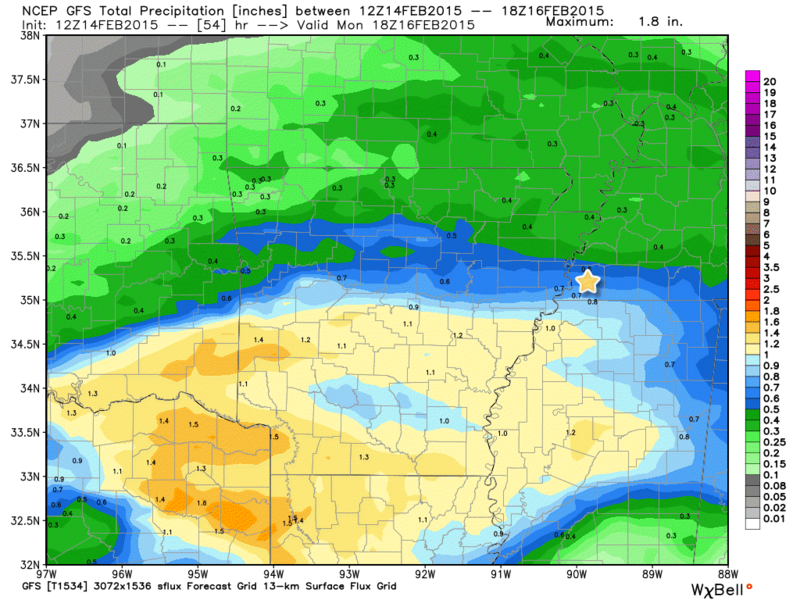 Total (liquid/melted) precip amounts through Monday morning from the latest NAM model show 0.3-0.4" for the metro. Some of this would fall as sleet and some as snow. The longer it sleets, the faster snow amounts decline. These amounts appear reasonable to us at this time. So what do we expect Sunday night/early Monday? With cold (below freezing) dry air in place and the possibility of a bit of warm air aloft, precip could start as sleet, or a sleet/snow mix, Sunday late evening. Currently, we believe onset will probably be in the 9pm-midnight timeframe. Overnight, it appears precip becomes steadier and becomes all snow. With temps in the 20s, the snow would be a little fluffier than usual for this part of the country, which serves to increase snow totals a bit given the same amount of liquid water. Precip end time is up for debate, but should be between dawn and mid-morning Monday. How much? After careful analysis and watching trends in the data, our first, very early, educated guess is up to 1/4" of sleet and 1-2" of snow in the immediate metro. Higher amounts are possible north and lower amounts south. However, we have recent model data that supports more sleet, more snow, and less snow. 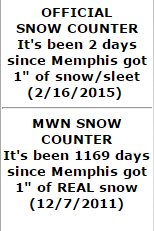 This may not seem like a lot, but for the Memphis area, it's enough to generate impacts, especially to travel. 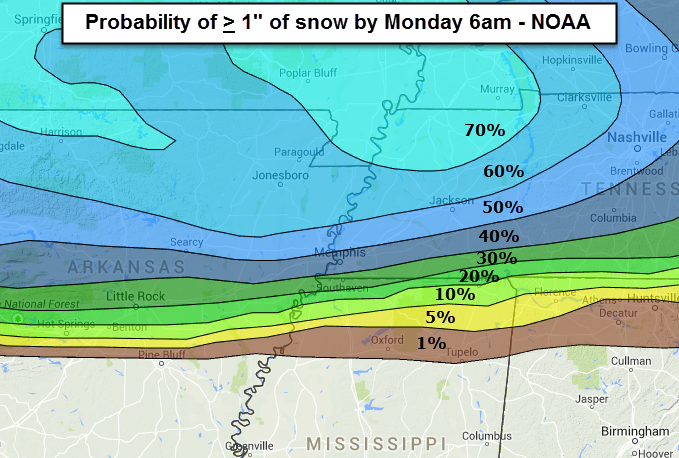 NWS graphic showing the probability of 1" of snow or greater through Monday 6am. Since precip could be ongoing, the numbers are probably a bit low. Areas north of I-40 have a greater chance of seeing more snow. 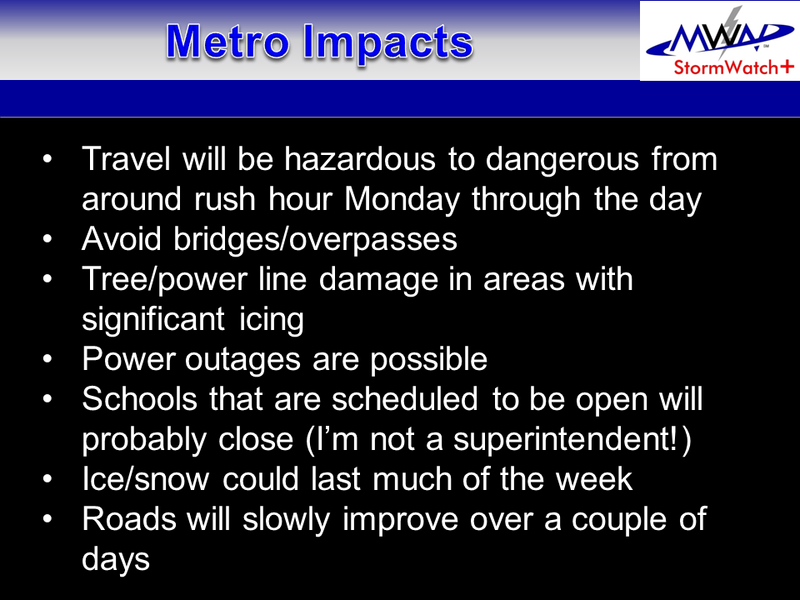 If the above forecast verifies, Monday morning rush hour WOULD be impacted. Fortunately it's a federal holiday and many schools are out so traffic will be lighter. Since we're not currently expecting freezing rain, ice accumulation on objects (power lines, trees, etc.) is not expected to be a big deal. However bridges will be slick and there will be fewer cars on the road to warm them up and melt whatever is there. Given that, the situation that developed last year in Birmingham and Atlanta is possible in this setup. In that case, a light amount of snow fell in very cold temperatures (just a bit colder than what we're expecting). The combination of tires melting the snow and very cold air re-freezing the snowmelt resulted in icy streets. Be aware of the possibility and plan to allow extra time if you have a Monday commute. A huge rush on the grocery stores is not necessary at this point (see, our forecast isn't sponsored by Kroger!). Note also that behind this system, very cold air will be in place with some data indicating we may barely get above freezing from Saturday evening through Friday of next week. The coldest period will be Wednesday morning when lows could drop into the single digits. Anything that falls could stick around a while, though roads with traffic would improve during the day Monday as precip ends. There's typically a lot of sharing of winter weather graphics on social media, especially those with "extreme" snowfall predictions. BEWARE THE SHARE! If it doesn't come from a source that you trust and that can EXPLAIN it to you (most people can't explain the nuances of a snow accumulation map), disregard and don't share! In addition, computer models make most of the maps people share. They're fallible, and they change regularly. What was valid 6 hours ago is not any longer. Trust the human forecaster with experience, not the computer model graphic, unless then human says "I think this is right" (as in the case above where we shared the NAM model graphic). 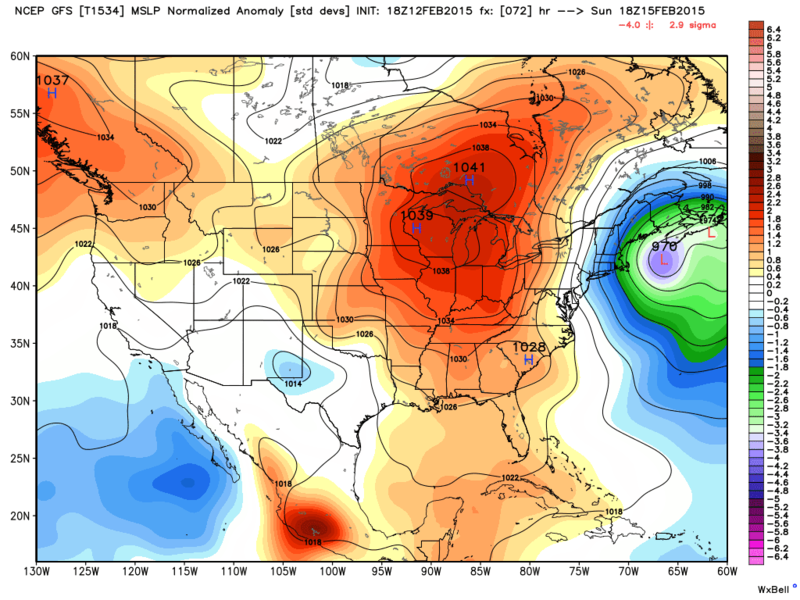 Anyone (literally) can find a model "solution" that is an outlier and post it as a forecast. 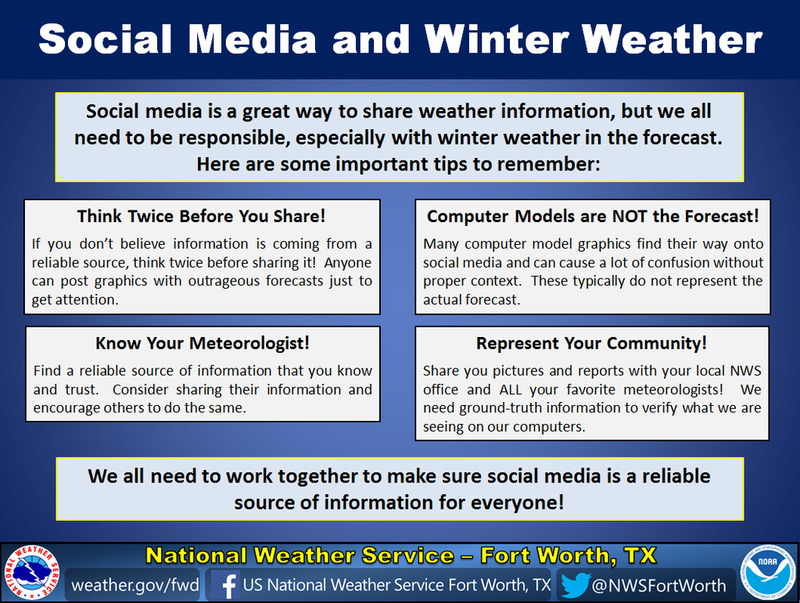 See the excellent graphic below, put together by NWS-Fort Worth, with more tips on using social media before and during winter weather. 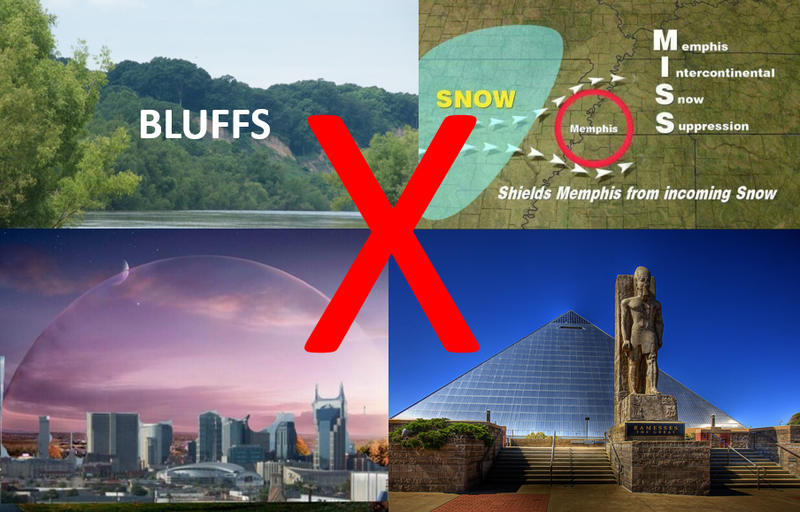 Despite many people's sworn belief in their powers, the bluffs, the Pyramid, the "snow dome,"and the Indian burial grounds have NOTHING to do with the weather. They don't deflect snow and they don't protect us from tornadoes. I KNOW it's been a long time since we had a "good snow." It's luck of the draw and climatology of the area. It's just not very common in this area. Yes, we're due. Maybe this one is it. I don't know. The graphics and memes are cute and it's nice to have fun with them, but know that there is no truth in any of those myths. We'll continuously monitor the latest data and keep you apprised as necessary to any changes. We're also planning a Google+/YouTube video chat this weekend, tentatively set for Sunday at 6:30pm to discuss the latest expectations and impacts. Monitor our social media accounts for more details on that informative discussion. Dry conditions that ended the year 2014 continued into 2015, although temperatures were near normal for the month. 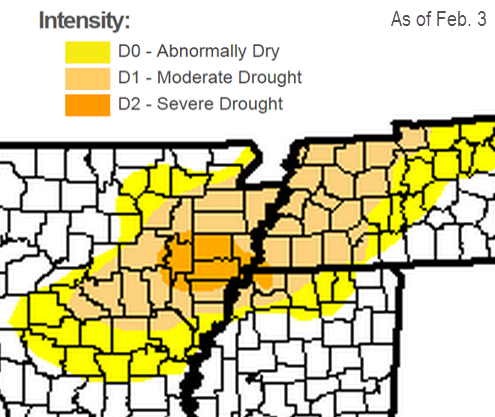 In fact, drought conditions are now present across the metro after a prolonged period of below normal precipitation. As of February 3, severe drought (D2 on a 4-point scale) is present in southwest Shelby Co., Crittenden Co, and western DeSoto Co, while the rest of the metro is in moderate drought conditions (D1). As in November and December, there was no severe weather during January. Temperatures started the month well below normal, but the second half of the month offset that start, resulting in an average for the month that was very "average." The last severe weather warnings issued by NWS-Memphis came on October 13. Accumulated precipitation (green) vs. normal (brown) for the past 90 days. 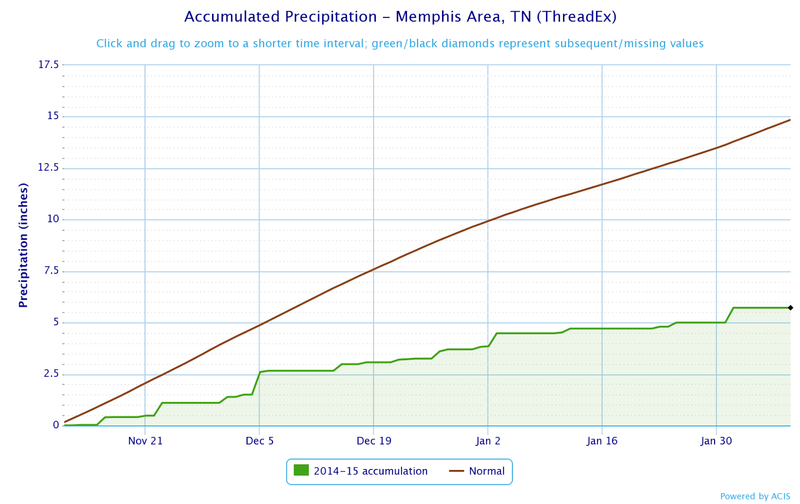 Memphis has received just over 1/3 of normal precip during this period. The Drought Monitor places parts of the metro in a severe drought as of early February. Comments: Only one day had precipitation above 0.25", which was the 3rd (0.63"). January 2015 was the 9th driest January in 142 years of record keeping. There were no thunderstorms or freezing/frozen precipitation recorded at the airport for the second straight month.